For as long as I can remember, as long as my dad has shown me movies, I've been a James Bond fan. I've seen all 22 multiple times, own well-worn copies of all of them on VHS, DVD, everything. Bond has always been one of my favorite series. I've dreamt of one day stepping into his world, visiting Pinewood Studios, but I never thought, one sunny April afternoon, that I would literally find myself standing on the set of a James Bond film. In the middle of an action scene. 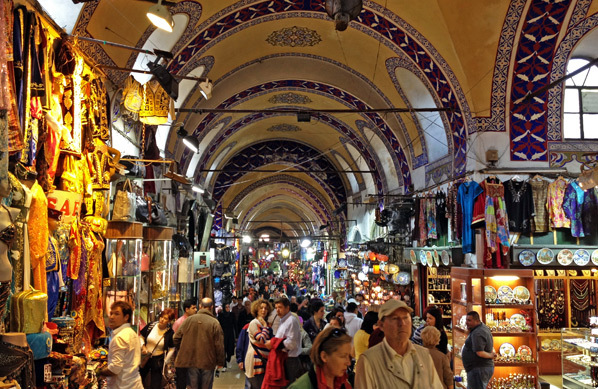 In the middle of a crowded marketplace in Eminönü in Istanbul… waiting for Bond to grab his Walter PPK and fire off shots. But somehow, this dream came true. 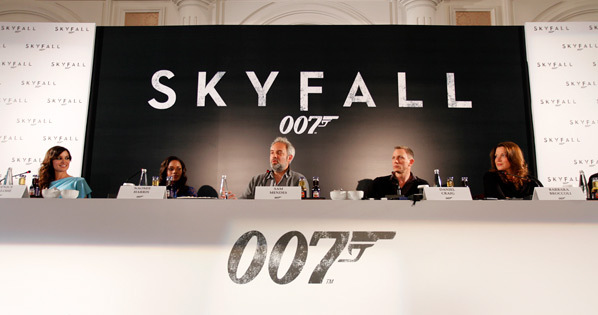 Just this past weekend, Sony Pictures & MGM took an international group of press to Istanbul to get a look at Skyfall. When I first arrived, my first time to Istanbul, and rode from the airport to Ortaköy where we were staying, it already felt like a Bond film. Just the city itself. That was a feeling, almost even an emotion, I kept having during the three days I was in Turkey. As we've already reported, Bond is returning to Turkey once again under the direction of Sam Mendes (American Beauty, Road to Perdition, Jarhead, Away We Go) this time, to shoot the opening action/chase sequence for Skyfall, which had already completed 103 days of shooting and still had 30 more to go. 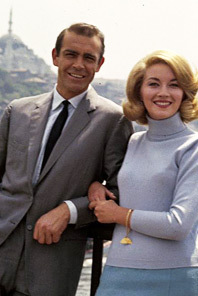 Back in 1963, Sean Connery filmed a large portion of From Russia with Love in Istanbul (see photo to the right), and as Barbara Broccoli kept mentioning during the press event, it was 49 years to do the day when they had been shooting in Istanbul - and here they were again. And here was I, there to experience it first hand. Barbara's father, legendary Bond producer Albert R. Broccoli, used to say to her, "Whenever you get stuck, go back to Fleming." And that's exactly what they're doing with Skyfall. Bond author Ian Fleming's favorite city was Istanbul, she says, and Sam wanted to "capture the essence, true to the spirit" of this historic city in Skyfall, yet do so without any of the "easy cliches" of Istanbul that it's known for. It's "an incredible backdrop to any movie," Daniel Craig told us at a roundtable interview the day before. I would agree, of course, but more than anything it works particularly well for a Bond film. I kept getting the feeling Bond was lurking around the corner everywhere I went. Daniel Craig states regarding Istanbul in From Russia with Love and The World is Not Enough: "By making the best Bond movie we can, we're going to look back a little, you kind of have to do that… but this has an individual look to it, something that I don't think we've seen in any other Bond movie. But we are—" Barbara Broccoli interjects, "It feels like we're making very classic Bond, and it's great to be back here in Istanbul." Along the way, we kept hearing stories about this massive action scene they were shooting in Istanbul. It would begin at a cafe, evolve into a car chase, one of them would crash in a crowded marketplace, they'd shoot at each other, grab motorcycles, and drive off for another big motorcycle chase all around Istanbul. Eventually they would be driving on the top of the famous Grand Bazaar, a massive covered marketplace, going through it, driving on the roof, crashing in and out of it, eventually driving to the suburbs onto to a train where it would continue. Everywhere we went, I felt like this could be happening now, to a real spy, somewhere around the corner (or on the roofs) in this amazing Eastern European city. When we finally got the chance to actually watch them shooting a scene, it was an exhilarating moment for me. We had gathered at Hamdi Restaurant (website) in Eminönü (which served delicious food) and proceeded to walk through a very crowded open market bazaar to get to the set. The section we passed included merchants selling every kind of bird imaginable, dog, cat & bird food by the bucket, leeches, spices, plants/flowers and everything else. They had fenced off a massive section near a huge mosque, which we soon found out was the set, completely controlled for the shoot. Normally an empty square, they had built a massive bazaar, which was where the car crash was, the shoot off would take place (Bond was behind some oranges), then Bond would grab his motorbike and drive off after Ola Rapace, whom he was chasing. While we only got to see them shoot one take, I can't even begin to tell you how surreal—how much of a movie geek fantasy coming true—it was to watch Daniel Craig, in his dapper agent 007 suit as always, become Bond and play the character, play the action, with Walter PPK in hand, in person, shooting a scene for the new movie. Here is Bond standing in front of me, chasing and shooting at a henchmen in the streets of Istanbul, and I'm watching it happen. Can this be real? Sam Mendes said it was taking them months to shoot this "small" sequence of the movie, getting every detail right (they had 15 Audis, 15 Landrovers, each in different states of damage, for the chase). But it was worth it, Bond was back in Istanbul, filming a scene that would definitely kick things off with a bang in Skyfall. Before flying out, I had the opportunity to see the new teaser trailer for Skyfall at CinemaCon, which should be released sometime soon. The footage in that teaser already gave me chills, it looks darker and bigger and better than the last Daniel Craig Bond film, and that's certainly because of what Sam Mendes is bringing to this. "None of the action means anything if you're not connected to the characters," said actress Naomi Harris, who plays Eve and is working alongside Bond in this scene. Mendes reiterated that it's "all about characters at the center who are pushed to the edge." And it looks like he's going to set the stakes right at the opening. Will it feel different from the last two films? Craig responds, "Yea. In every way! Really, in every way. We've got a different team together, we've got a different bunch of people… I think it's a very rare thing to be able to make movies like this, and given the chance you have to give it all you've got." During the press conference, Sam Mendes said that in choosing locations to shoot, he often wants to "exploit and celebrate" the area, including Istanbul. So in this "short" opening sequence, they're trying to capture its essence and modernity. While it's well-known that Bond is a world traveler, I can't think of a more amazing city with exactly these kind of aspects to use to kick off Skyfall (but maybe that's just because I was visiting the perfect time of year), it's wonderful. I had no idea Istanbul was this beautiful and this Bond-like, even after watching From Russia with Love again on my flight over. Maybe that lead to my constant Bond-like experience, where everywhere I went it felt like we were always in a Bond movie. While waiting for our visit, myself and a few other press strolled underneath a nearby bridge over the Bosphorus filled with local fish restaurants. We joked that it was easy to imagine a car chase happening above, cars and debris flying off randomly into the water around us. When we visited the Grand Bazaar later on (photo below), I could instantly imagine Bond on motorcycle driving through it, causing chaos at the expense of the British Secret Service, pursuing that elusive henchman. When we were on the set, it didn't even feel like a set, it felt like a real market in Istanbul (although a little less packed together) where Bond had, haphazardly, ended up. It all felt real. But it was just Istanbul, the beauty of it, the magic of the movies, the magic of James Bond, with Sam Mendes and Eon Productions bringing it all to life. Here's my own photo exploring the stunning Grand Bazaar in Fatih, Istanbul, where part of the chase takes place (they had filmed most of this chase before we arrived). I've been on many sets over the years, big and small, to watch action scenes and dialogue and more. But this is one experience I can never forget. Not just because it's James Bond, and that personal connection, but because of the city, the location, because of how amazing it was to be there in person, to see this elaborate set they built that felt like it belonged there. I can interview actors anywhere all over the world, I can watch movies in screening rooms anywhere, Hollywood is (currently) my backyard, but there is absolutely nothing that compares to setting foot on a huge movie set in the middle of Istanbul for a Bond film. I know I keep repeating how incredible this whole thing was, but I can't help it. These are the experiences I truly live for. Asked if he feels he's in a comfort zone, Craig responds: "No. Not at all. I'd hate to feel in the comfort zone while working, that's not the way I like to do things. You want to be pressured, and you want to be challenged every day, and we are, on this movie, challenged every day. It's just a relief for us, we've been filming at Pinewood in sort of fairly dark locations for the past however many months, and it's great to get out and shoot. Come to Turkey and film in some amazing, beautiful locations, it feels like old fashioned Bond." Movies are a lot of my life, they've defined me, they've provided me with so much more than entertainment, but Bond in particular has always been close to me. I'm not sure what it is, perhaps it's the appeal of this classy spy, who can get any woman he wants (except Moneypenny), who travels the world, who saves the world. Whatever it is, I love the franchise, I love the films, every last one (yes, even Quantum of Solace I enjoyed) and I'm always excited for the newest one, to see how they've progressed the character, to watch 007 foil villainous plans and save the world all over again. After a couple years delay due to MGM's financial woes, they're back again with Skyfall, for their 50th Anniversary (Dr. No was made in 1962) this year. Many wonder if dreams do come true, and I am here to say they occasionally do. Even though I only got home last night, I still can't yet believe I was just there. Maybe it won't really hit me until I'm sitting in a theater watching Skyfall this fall, seeing this set I was standing on now a part of the 23rd Bond film, continuing a 50 year legacy that has been a big part of my life, and the lives of many movie lovers. It's not over yet, 007 hasn't retired, and it doesn't seem like he will anytime soon. Especially if Sam Mendes pulls off the awesome Bond film it seems he's on his way to creating. The kind of Bond film that will remind us all why we love this character, why we love this series and all 22 (soon 23) of the movies in it, why we love watching agent 007 of MI6 hunt down the evil villains of the world. Shaken, not stirred. As I've been doing for nearly my entire life, I will certainly be in theaters opening day to see Skyfall, to experience Daniel Craig as Bond chasing Ola Rapace through the streets of Istanbul. Watching anxiously to see where it goes next, hoping that Mendes has created a new classic, still wondering if this set visit actually happened, if I was really there. I cannot wait. I'm now beyond excited to see Bond 23—Skyfall—finished, in full this year. November can't come soon enough. Thank you Sony Pictures for an unforgettable experience. Shaky cam? Please don't let there be shaky cam. Definitely not, his cinematographer is Roger Deakins. THE Roger Deakins, of No Country for Old Men, Jesse James, True Grit, The Village, Doubt, The Reader, Fargo. It'll look fantastic. That is probably the best news I've heard today. Wow I had no idea!! Jesse James looked so beautiful! You know, I haven't paid that close attention to cinematographers before, but now that you mention it, all of those films benefited very much from good cinematography. I'm sure the scenic quality of Skyfall will be quite breathtaking. I am glad to know that you visited and loved Istanbul, Alex.. Thanks to Bond, my favorite movie reivewer came to my city, what a pleasure! :) By the way, did you have a chance to visit more locations in the city? Or just around Grand Bazaar and Eminönü? Because if you did not, you should come again..
Billington. Alex Billington: International Man of Cinema. Steady, not shaken. The closest thing I've ever came to this experience was smoking pineapple express while watching Pineapple Express. You are a very lucky man Mr. Billington. Hey, it´s great to read an article written with so much passion and love for he movies. This is an experience for your whole live, Alex. Thanks for sharing it so well with us. i have rarely been as nakedly envious of you as i am at this point. awesome, in the original sense of the word. great article, @buddha1822:disqus, a little window onto a world in the making that most of us will never experience. and i am *very* encouraged by Craig's assertion that "You want to be pressured, and you want to be challenged every day, and we are, on this movie, challenged every day. ...it feels like old fashioned Bond." amen to that! Fantastic article here Alex, I'm definitely awaiting the new Bond with great anticipation!